Buried in the old law books is the fascinating and law-altering case of The King v Penn and Mead. It was the seminal moment of trial by jury. The law it created would define the sometimes rocky relationship between judge and jury for centuries to come and be a harbinger of the essential doctrine of jury nullification. The incident occurred on Sunday, August 14, 1670, on Gracechurch Street in London. There were two preachers, preaching together. One was lawyer and leader of the Religious Society of Friends, better known as the Quakers, William Penn (1644-1718). Penn later became famous as the founder of the state of Pennsylvania. By 1670, he was 25 years old, and had been expelled from Oxford but learned law at Lincoln's Inn. He was independently wealthy; his parents were land-owners in Ireland. Penn was known to the authorities as a rabble-rouser having spent eight months incarcerated in the Tower of London in 1668 on charges of blasphemy for his early religious writings. This was no ordinary 25-year old. His later writings confirmed his political genius, arguing for equality of all men well ahead of his time and even proposing a European Union (which he called a "European Diet, Parliament or Estates"). 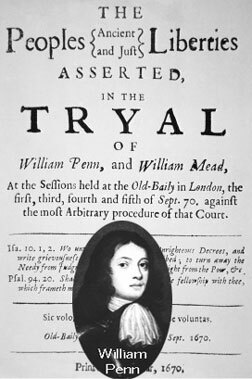 By Penn's side, on that Sunday morning in 1670 on Christ-Church Street was a law student, William Mead (also spelled Meade). Together, they spoke of things Quakers speak of: pacifism and simplicity. Eventually, about 300 people gathered to hear the two preach about the Quaker way. This attracted two local constabularies, James Cook and Richard Read, who would have been lost to history but for this one day in time. Cook and Read promptly arrested the two preachers. The two Quakers were required to attend Sessions Court at Old Bailey on September 1 and to answer the indictment for an unlawful and tumultuous assembly, before a bench of four presided by Mr. Justice Thomas Howel (his formal judicial title was Recorder), two other judges, Thomas Bloodsworth and John Robinson, and one observor, the Lord Mayor of London (Samuel Stirling) . "... a talking bragging bufflehead ... as very a coxcomb as I would have thought had been in the City ... nor hath he brains to outwit any ordinary tradesman." Of the jury, the names entry into legal history: Thomas Veer, Edward Bushel (sometimes spelled Bushell), John Hammond, Charles Milson, Gregory Walklet, John Brightman, William Plumsted, Henry Henley, Thomas Damask, Henry Michel, William Lever and John Baily. To lawyers and law students, the groundbreaking case became affectionately known as Bushell's Case. "That William Penn, Gentleman, and William Mead, late of London, linen draper, with divers other persons to the jurors unknown, to the number of 300, the 14th day of August in the 22d year of the King, about eleven of the clock in the forenoon, the same day, with force and arms, etc. in the parish of St. Bennet Grace-church in Bridge-ward, London, in the street called Grace-church street, unlawfully and tumultuously did assemble and congregate themselves together, to the disturbance of the peace of the said Lord the King. AND THE aforesaid William Penn and William Mead, together with other persons to the jurors aforesaid unknown, then and there so assembled and congregated together. THE AFORESAID William Penn, by agreement between him and William Mead before made, and by abetment of the aforesaid William Mead, then and there, in the open street, did take upon himself to preach and speak, and then and there did preach and speak unto the aforesaid William Mead, and other persons there, in the street aforesaid, being assembled and congregated together, by reason whereof a great concourse and tumult of people in the street aforesaid, then and there, a long time did remain and continue, in contempt of the said lord the King, and of his law, to the great disturbance of his peace, to the great terror and disturbance of many of his liege people and subjects, to the ill example of all others in the like case offenders, and against the peace of the said lord the King, his Crown and dignity." Penn and Mead both pleaded not guilty. Their case was put over until September 3. On the third, the defendants were asked to remove their recognizable hats and as good Quakers, they refused to do so and were promptly fined for contempt of court by Justice Howel (the local recorder). The first witnesses were the constabularies Cook and read but their evidence certainly did not reflect the exaggerated indictment. Nor could either remember what either of Penn or Mead actually preached. Penn: I desire you would let me know by what law it is you prosecute me, and upon what law you ground my indictment. Justice Howel: Upon the common-law. Penn: Where is that common-law? Justice Howel: You must not think that I am able to run up so many years, and over so many adjudged cases, which we call common-law, to answer your curiosity. You are a saucy fellow, speak to the Indictment. Penn: This answer I am sure is very short of my question, for if it be common, it should not be so hard to produce…. The question is not, whether I am Guilty of this Indictment, but whether this Indictment be legal. It is too general and imperfect an answer, to say it is the common-law, unless we knew both where and what it is. For where there is no law, there is no transgression; and that law which is not in being, is so far from being common, that it is no law at all. Justice Howel: Sir, you are a troublesome fellow, and it is not for the honour of the court to suffer you to go on…. Take him away. My lord, if you take not some course with this pestilent fellow, to stop his mouth, we shall not be able to do any thing to night. And at that, Penn was removed from the courtroom leaving only Mead to mount a defense. This is when the magical moment occurred. Howel roughly summarized the scant evidence and directed the jury to make the correct decision "upon the matter of fact, which you are to keep to, and observe, as what hath been fully sworn at your peril." The Bench used many unworthy threats to the four that dissented. John Robinson: Mr. Bushel, I have known you near this 14 years; you have thrust yourself upon this jury, because you think there is some service for you: I tell you, you deserve to be indicted more than any man that hath been brought to the bar this day. Edward Bushel (jury forman). No, sir John, there were threescore before me, and I would willingly have got off, but could not. Bloodworth. I said, when I saw Mr. Bushel, what I see is come to pass, for I knew he would never yield. Mr. Bushel, we know what you are.... You are an impudent fellow, I will put a mark upon you. "Guilty of speaking in Grace-church street." It was clearly insufficient and Justice Howel was livid. Justice Howel: Gentlemen, you shall not be dismissed till we have a verdict that the court will accept; and you shall be locked up, without meat, drink, fire, and tobacco; you shall not think thus to abuse the court; we will have a verdict, by the help of God, or you shall starve for it. Penn: My jury, who are my judges, ought not to be thus menaced; their verdict should be free, and not compelled; the bench ought to wait upon them, but not forestall them. I do desire that justice may be done me, and that the arbitrary resolves of the bench may not be made the measure of my jury's verdict…. You are Englishmen, mind your privilege, give not away your right. Justice Howell: Stop that prating fellow's mouth, or put him out of the court. At that, the jury was sent away again with strict orders that the jury was not to be provided with food, drink fire or even a chamber pot. Justice Howel: I will have a positive verdict, or you shall starve for it…. Your Verdict is nothing, you play upon the Court; I say you shall go together, and bring in another Verdict, or you shall starve; and I will have you carted about the city, as in Edward III's time. All the while, Penn incessantly continue to speak to the jurors, begging them not succumb to the judicial intimidation, all of which just riled Howel and his three henchmen on the bench even more, and all of which is duly recorded in the law reports. Again the jury was sent away. The next morning, they returned a unanimous verdict of not guilty. Justice Howel: I am sorry, gentlemen, you have followed your own judgments and opinions, rather than the good and wholesome advice which was given you; God keep my life out of your hands, but for this the Court fines you 40 marks a man; and imprisonment till paid. Penn demanded to be let free but Howel ordered that he be taken to Newgate prison until he paid his contempt of court fine. But on this trip he was accompanied by the 12 members of the jury all imprisoned until they, too, paid their new fines. "The jury must be independently and indisputably responsible for its verdict free from any threats from the court." By 1682, William Penn had crossed the Atlantic Ocean. Some three-hundred plus years later, the relationship between the presiding judge and his or her jury is not always seamless. About once a decade in practically every common law jurisdiction, some judge somewhere, likely close to retirement, goes too far in directing the jury and from the mothballed collection of the ancient law reports is produced R v Penn and Meade. To this day, there is a plaque in Old Bailey (see image, above) which commemorates the courageous and historic stand taken by these 12 men against a bullying court.